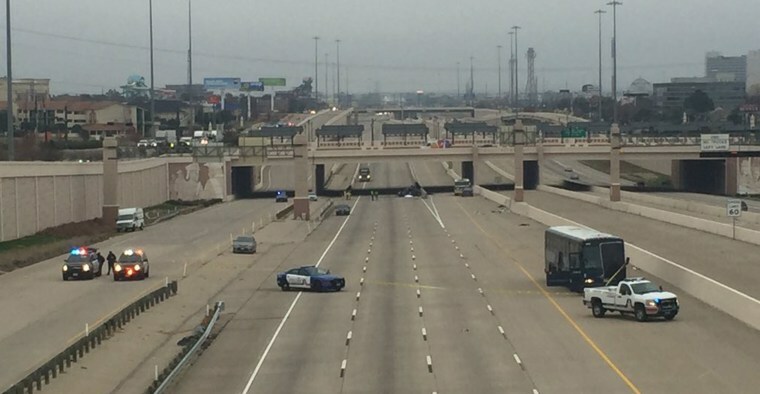 One person in an SUV was killed, another was flown to hospital and 16 Greyhound bus passengers were injured Sunday in a crash in Arlington, Texas, officials said. The bus was en route from Dallas to Amarillo when the collision occurred on the westbound I-30 at 5:35 a.m. local time (6:35 a.m. ET), Greyhound spokeswoman Lanesha Gipson told NBC News. Forty passengers were on board, plus the driver, she said – adding that all the injuries seemed to be minor. The critically-injured person, who was in the SUV, was flown by helicopter to a local trauma center. Prior to the crash, a 911 caller reported that the SUV was "exhibiting erratic driving behavior and swerving," Arlington Police spokesman Christopher Cook said. The vehicle struck a concrete barrier, then became "disabled" in the interstate's left lane, Cook said. "While officers were responding, we received a secondary collision call that a Greyhound bus traveling westbound had struck the disabled SUV," Cook said. Investigators were processing the scene Sunday and conducting a forensic examination, Cook said.